Bulletins will be available by noon on Fridays. “Wise Disciples Do Not Repeat Their Mistakes"
"The Communion of the Saints"
Many of us are impatient by nature. Long lines at the store or those irritating folk who check their email at stop lights only to have us sit through another cycle of the “green, amber, red” bring out the worst in us. So why does God make us wait? It is a fair enough question, I think, and maybe we can hint at some possible answers. First, waiting makes us consider the value of what we are asking for. I have certainly returned an item to the shelf unwilling to be bothered waiting in line for something that I can perhaps do without. But if it’s ice cream I really need, then waiting for it adds to the value of the ice cream, and we enjoy it all the more when we finally arrive home (and by now it’s at that perfect temperature for eating). Second, the Lord knows when something is best for us and the effect of it on others. There are circumstances that require the Lord to delay—for our good and for others—that we may know nothing about. He wishes to bless you at a certain point in time so that you will be in a position to bless someone else who has a particular need at that same moment. Third, waiting on the Lord keeps us talking to him. And that is how it should be. Perhaps without the need, we would flitter our days without speaking to the Lord. And talking with our heavenly Father is the greatest privilege we have. Waiting will strengthen our prayer muscles and make us fitter. Catharine and Rick Halkyard on the birth of their son, Edwin James Halkyard, who was born on November 1. Grateful grandparents are Cathy and Ken Wingate. Grateful great-grandmother is Peggy Wingate Benson. Hannah Engroos on the adoption of her son, Matthew (Dez) Desmond Engroos (3), on November 1. Jenni and Cameron Runyan on the birth of their daughter, Catherine Annabelle Runyan, on November 1. Items for Church Family or People for Prayer? 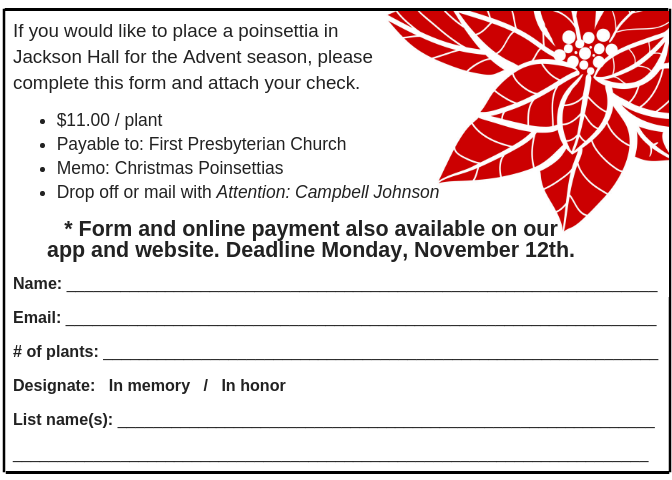 Contact Lisa Eargle 803-799-9062, Ext. 244. 11 Operation Christmas Child shoeboxes are due. Boxes and brochures can be found in the Atrium. 17 Encouragers’ Breakfast - 9:00 a.m. in the Small Dining Room - Cost is $5.00. RSVP to Lisa Eargle at leargle@firstprescolumbia.org by Monday, November 12. 17 College Inquirers Class - 8:00 a.m. in BR125. Contact a college staff person to sign up. 18 The Sacrament of the Lord’s Supper - During our morning services, we will observe the Sacrament of the Lord’s Supper. The time ahead of us, therefore, is one in which we prepare for a joyful gathering at the table of our Lord Jesus Christ. 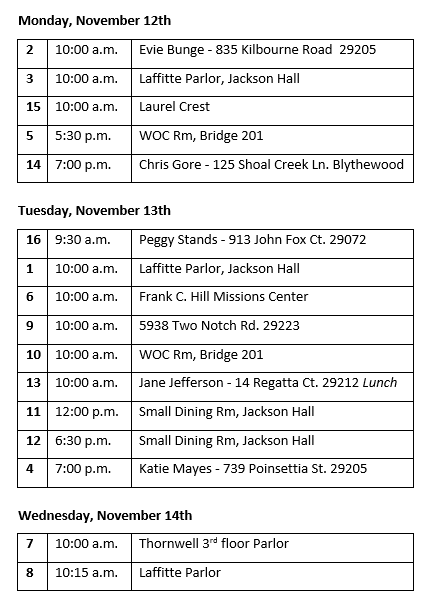 18 College Luncheon - 12:30 p.m. in Jackson Hall. If you would like to volunteer to help, please contact Rebecca Milford at rmilford@firstprescolumbia.org .